WARSAW, Poland -- It's an ethical dilemma that has Western leaders in a bind: to boycott or not to boycott Ukraine-hosted matches in the European soccer championship over the alleged abuse of jailed opposition leader Yulia Tymoshenko? When Tymoshenko launched a hunger strike last month after saying she was beaten by prison officials, several European leaders vowed to boycott Ukraine during Euro 2012 in protest, with even German Chancellor Angela Merkel threatening to stay away. But many warn that to shun Ukraine could do more harm than good. Leaders, sports officials and even some rights activists argue that using Europe's most prestigious sporting event to punish Ukraine is hardly likely to win Tymoshenko's release. On the other hand, it could alienate Ukraine further from the West, demoralize its people and create a troubling sporting precedent. For instance, will countries now shunning Ukraine, which co-hosts the tournament with Poland, also be willing to take a hard line against economic giant Russia when it hosts the Sochi winter Olympics in 2014 and the World Cup in 2018? Russia, after all, also has political prisoners and a spotty human rights record. The United States led a boycott of about 50 countries against the 1980 Moscow Olympics over the Soviet Union's invasion of Afghanistan - and that was widely seen as a flop that made no difference to the conflict. It's no surprise that Russia's Vladimir Putin, who returned to the presidency this week, says Tymoshenko's case and Euro 2012 should be kept separate. ''One must not in any circumstances mix politics, business and other questions of this sort with sports,'' Putin said last week. ''If you do that, then you remove an important element in international relations,'' said Zaborowski, director of the Polish Institute of International Affairs. He argued that major sporting events - including soccer matches between political foes like Turkey and Armenia, and the U.S. and Iran - have helped ease tensions by giving politicians, athletes and fans a chance to interact in a nonpolitical space. Sports can also be a morale booster for people living in oppressive systems, Zaborowski said. During the Cold War, for instance, participation in Olympic games and other international competitions lifted the spirits and pride of Eastern Europeans by giving them a stage on which their athletes could excel. Should regular Ukrainians, who are already struggling with poverty and corruption, also have their party ruined due to this political controversy? These issues are sparking a great deal of debate in co-host Poland, Ukraine's neighbor to the West. 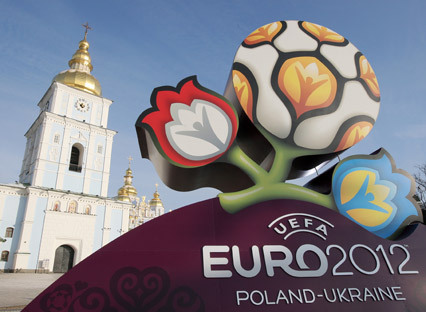 The tournament opens June 8 in Warsaw with a Poland-Greece match and ends in Kiev on July 1, with matches in between in four Polish and four Ukrainian cities. ''Such a situation cannot be tolerated'' by the EU, Kaczynski said. But Prime Minister Donald Tusk and President Bronislaw Komorowski, while also critical of how Ukraine is dealing with Tymoshenko, strongly oppose a boycott. Warsaw, of course, can hardly act against its co-host in the tournament, which is seen as a chance for the two ex-communist states to prove themselves as efficient and modern. A failure for Ukraine would be a failure for Poland, too. But the stance by Poland, an EU member, is also firmly in line with a long-term strategy of promoting democratic change on its eastern border by engaging Kiev. Warsaw fears that a punishing approach could push Ukraine closer to Russia. Tymoshenko is serving a seven-year prison sentence on charges of abuse of office while negotiating a natural gas contract with Russian in 2009. The former Orange Revolution leader charges that Yanukovych, her arch-foe, orchestrated her jailing to get her out of the way during October parliamentary elections. Western leaders also have strongly condemned the case as politically motivated and have been increasing their pressure on Kiev since she began her hunger strike. Though sports should, many argue, be a space free of politics, there is a long history of politicians using it as a tool - most dramatically with threats to boycott Olympic games. Experts say these have never really done much to change the situation on the ground, though athletes have found their dreams of competing slashed after years of training. The boycott of the Moscow games, spearheaded by President Jimmy Carter, caused bitterness that lingered for years. ''What did it help in 1980 that the U.S. didn't compete? The Soviets still stayed in Afghanistan,'' said Bill Mallon, a past president and co-founder of the International Society of Olympic Historians. In 1978, the Netherlands led calls to boycott the World Cup in Argentina to protest a military dictatorship and its human rights violations. But the boycott didn't happen. To be sure, nobody now is talking about keeping national teams from competing in this summer's championship. But EU President Hermann Van Rompuy, European Commission President Jose Manuel Barroso and the governments of Austria and Belgium say they will stay away. Merkel vows to do the same if treatment of Tymoshenko doesn't improve. While many fans probably don't care if one politician more or less is sitting in the stands, all the talk of a boycott is already embarrassing Ukrainian leaders. ''We found the resources, built the stadiums, the airports, bridges, roads, interchanges, renovated hospitals and now they are telling us: boycott Euro,'' Ukrainian Prime Minister Mykola Azarov said Monday. UEFA, the European football association that is organizing the event, not surprisingly also opposes a boycott of Ukraine. Michel Platini, the president, sent a letter in March to a human rights group and the parliaments of the EU, Sweden and Germany acknowledging Kiev's problems but arguing that the matches and other activities planned on the sidelines could help Ukrainian society. Platini wrote that when UEFA decided to stage Euro 2012 in two ex-communist countries, its goal was to open up to a part of Europe that had never hosted a championship.